Recently I searched for old photographs of Hemel Hempstead on the Internet and came across this site which bought back so many memories of growing up there in the 70’s. It is worth a look if you too remember how it used to be, some classic shots amongst them. On a trip back last year I was amazed how much Hemel has changed but then I can think back quite a way and guess most towns change a LOT in 30 odd years. It was a new town in the green belt in the 1960’s (this photo was taken by Dad in 1961) and the aspirations were clear and quite quaint when you look back now. A couple of my friends have continued to live in the area and probably don’t notice the changes the way I do… although I did get favourable comments that there is now a decent department store in the form of a new Debenhams! Here are some of the shops I remember which won’t interest you if you don’t know Hemel or don’t like shopping!! The shops I most remember in the Marlowes are Peacocks which was a decorating store selling wallpaper and general DIY goods. The purple peacock logo caught my eye above the window and there was many a trip there on Saturdays with my parents. That was near the magic roundabout end and on that corner was a large WHSmiths (Blockbusters video shop when I last saw it). Beyond was the green and wall where we’d wait for the bus. The Seafarer Restaurant nearby was great with it’s bright orange seats and canteen-like service. We’d go there for fish & chips during school holidays. I most remember the walls which had large bronze effect wall murals of what I took to be either Bodica and her chariots with horses galloping in front or something to do with “In The Hall Of The Mountain King”. They were stunning when I was at that impressionable age and I can still picture them so clearly – perhaps they were actually cheap plastic things, who knows. Further up on the same side, Garlands was full of exciting ornaments and gadgets. That was the first place I saw those big clocks with ball bearings moving around to tell the time. Then was Taylor & McKenna (light blue & white logo), a toy and model shop. Dad used to go upstairs as there was a great choice of those small enamel paint pots with coloured lids he liked to use, they had a very recognisable smell. He also bought clay for modelling, diecast figures and model plane kits. Next to that shop was an open bit, slightly recessed, with a pond and fountain. I think there were some mosaic murals round the side of fishes. There was a ramp going round the back which we walked up to get to the Wimpy Burger Bar. Ahh, Wimpy, home of many holiday treats. I always wanted, but could never finish, the Knickerbocker Glory!! Then there were some more shops I can’t remember, a big open area, then Boots and Sainsburys. This open area had seats around and was a popular place to stop for a rest. Boots was where my Auntie worked for a while and I remember seeing her on the front tills in her uniform but not wanting to disturb her! She must have loved that kind of job as she enjoyed chatting with people so much. Before that she worked in the old Co-Op building near the multistorey car park. Boots is where I first remember being let loose around town with a friend. The first single I bought was in there, of all things “It’s My Party And I’ll Cry If I Want To” by Dave Stewart and Barbara Gaskin, perhaps I shouldn’t admit to that 😮 We’d also spend ages around the make-up counter. Memories of Sainsburys revolve around their old sturdy brown paper bags with the orange logo on and several favourite things to buy – twiglets in the old Peak Frean packaging and toffee apples hiding amongst the boring fruit and crisps. I had a mishap in Sainsburys when very small. Mum sat me in the front of the trolley and went further down the isle to buy something. I decided to lean out to pick something off a shelf and tipped the whole trolley over!! It must have made quite a crash and shocked Mum no end… although upset, I walked away unscathed. Then came the “high pavement” bit, not a lot up there but I did have my ears pierced in the hairdressers. Crossing over from Sainsburys there was a downstairs sweet shop, possibly Maynards, with a restaurant upstairs that we went into regularly for toasted teacakes and coffee (now a pizza restaurant?). Up a bit further was the open air market. I enjoyed wandering round there many Saturdays and bought several fashion statements of the time including a maroon leather jacket, those clear blue plastic macs (very fetching) and teabag shoes. I distinctly recall all the two tone clothes hanging up and hearing Fat Larry’s Band playing “Zoom” so I guess that was early 80’s. Woolworths is the only shop still further down I think. It used to be a much better shop and the photo booth was always a pull – the photos to prove it are somewhere in my scrapbooks ready to embarrass various friends. Was The Living Room nightclub next door? I never did go there as I left Hemel before I was at that age but it was popular with Longdean’s sixth form. Craftsmith was the best ever arts and crafts shop on one side of Bank Court. It had an upstairs that went part way over the centre of the court and I’d often buy things in there. On the other side of the court was Raynes, an (even then) old fashioned women’s clothes shop. There was a display window on the corner in front of the doorway where I used to play hide and seek every time we passed when very young! The only other shop I really remember was the fishmongers near the end. It always had weird things in the window like big prawns and pink Taramoslata, loved the name so memorised that before I knew what it was. Inside they had fish tanks around the walls high up so I liked watching those enough to put up with the smell when we went in. At the end on that side stood the Wagon & Horses pub, perhaps the Co Op building was after that. Then who can forget the big multi storey car park in Moor End Road with the famous orange and yellow ball revolving on the top. The water gardens were lovely, we mostly parked at that end where there were trees between each row of cars. We crossed a bridge over the river and I often took our stale bread to feed the ducks and swans there. There were a few shops in Waterhouse Street, one had a working model of a railway in the window which always fascinated me. I mustn’t forget to include the Dacorum Pavillion, home of many local Ideal Home Shows which I loved even at that age! I guess there was a goodie bag and a few stalls which appealed to me. It was always bustly with lots to see, people demonstrating new things you hadn’t seen before. We went at other times but can I remember what for now. The last event I saw there was Leo Sayer in concert, the building brought back so many memories with the different levels and open areas in between the entrances to the main hall and stage. I picture the decoration as being lots of burgundy velvet curtain and gold details. We also went to the Odeon cinema frequently, alas no longer there, and had dinner in Seapride next door afterwards. This photo was taken from a website, alas not by me! In summer holidays Mum and I would often walk along the footpath through the water gardens beside the River Gade to an area further up where there was a large pond. I’d take my fishing net and bucket and catch tiny fishes… which I put back of course (just found the pic below which brings back some happy memories). There was also a playground with fantastic castle walls to climb on, it even had ramparts which were tricky to walk along. There is a picture of this area on the website mentioned above but surely it was much much bigger than that!! Further up was the large playground on the other side of Warners End Road and behind the Registry Office. A great place in the summer as there was an open swimming pool, climbing frame, swings, seesaw, and the infamous rocking horse I fell over the front off when very small. There was a tunnel through the hillside, a big round concrete hole leading through to the main part of Gadebridge park, very exciting to run through or over at that age. The park itself was lovely, home to the fun fair in the hols and a bowling club area. St Mary’s Church, still lovely, sits to one side with its walled gardens. The Old Town I loved even before doing Local Studies in the 1st year of Longdean. At that time we took rubbings of the pastoral plates beside the doorways, learnt about the origins of the name Hemel Hempstead and who invented the Quern made out of Hertfordshire Pudding Stone. Some memories never fade! There was a great Wagons art shop up there but the best shop was the pet shop, or was it purely a tropical fish shop? I always stood in front of the fish tanks fascinated by the red and blue Japanese Fighting fish who couldn’t be in the same tank as each other and the scary Scorpion fish who’s tentacles could kill. I could watch them for hours so guess I love fish!! When Steve visited recently he reminded me about how the water gardens used to extend further towards the Dacorum. Apparently they ruined the site over 20 years ago ready for development, that never happened and the grounds were left in a mess and all barricaded up. Now the whole area has been redeveloped and they have reintroduced something very similar – better late than never. There was a pond up that end as well and now I remember an underpass and the fact that you walked through it all on the way to the sports centre. That’s about all for the town centre itself. When I had a rabbit we’d visit Piccotts End Mill, a little further out of town. You turned off the road, crossed the River Gade, into a large open space where usually a sheepdog or two would be waiting. The old mill was to the left and to the right was a large barn. We mainly went for straw, hay and dog biscuits but I used to look at the horsey stuff when I went through the “Mum I want a pony” stage!! The river had bullrushes and watercress growing at the edges, a very pretty place reminiscent of older times. At the other end of town in Station Road was the Art Centre where I went during half term a couple of times. A lovely old building with rickety floors. Always children’s crafts in the window. I did some painting and can’t for the life of me remember what else or who I went with. Next to that is a pub, still there, called “Ye Old Projectionist” which has lots of cinema related things. Nearby is the Dacorum Sports Centre where I used to go swimming often. I haven’t seen it since the big refurbishment. At one time I went to classes and we went with the school as well. There was an outside pool which great fun in summer and always very busy. If anyone wants to set me straight on any mis-rememberings or has more to add, please put your comments below. I’m glad you remember Maria and thank you for passing my details on to Clive. I really hope to hear from him in the hope that he can sort out my ‘memories’. I’m seriously into ‘memory mode’ at the moment and so much is tumbling out that it really is driving me crazy. Hi, thanks for your vivid description of Hemel in the 1970s. I have the very same memories . I went to Bourne Valley school from 1974-1979 . I now live in italy . Would love to be contacted by any old school mates . I wonder if you have any information about Andres Segovia, the Guitarist, appearing in concert at The Pavillion. He died in 1987, and his last UK tour was a few years before that, so I would guess somewhere between 1977 and 1985. I can’t seem to find any information on line. Hi, I went to Adeyfield School (Longlands) 1959 – 1964 and would love to connect with any old friends. Did you work with Michael Sturgess at Shell during this time? No, I didn’t work at Shell….I worked for Honeywell Controls after leaving school. Hi anyone went to Highfields school between 1963 and 1966, who might remember me. So nice to read about the old Hemel I grew up in. So much of the article above brings back fond memories. I attended Rossgate school but was moved to Gade Valley and from there went to Halsey which is now gone. I also attended Dacorum College for three years. I remember well the old WHSmith, the Odeon, the Pavilion,the co-op. buying models in Taylor and Mackenna, sports kit in Spivy and so many other places. I once worked in the White Hart in the old high street when it was run by the Vaseys and then worked for Ralph and Delia Jones when they had the Red Lion pub at Water End. The Town has changed so much now and I am not sure the changes are for the better. I have many old photos of Hemel from when I was growing up there and it is nice to come back and visit as I still have lots of family there. I often wonder what happened to the people I went to school with and worked with so if any of you see this I send you my greetings. Great memories. I was born in adeyfield in 1953. Lived on Windmill Rd, went to adeyfield and longlands. Did paper routes from both newsagents in Queens Sqaure. Was in the choire, then alter boy at St Barnabas. Was a member of the boys brigade (6th Hemel). In 1967 my family moved the US. Google earth has some great street level pics of the area. It’s been 50 years and it seems like yesterday. What a great place to grow up. Walked and rode my bike everywhere. Thanks everyone for the memories. Hi, I’m a bit older than you…..I graduated from Adeyfield (Secondary Modern) in 1964. Enjoy your memories. I also delivered papers up Longlands from Queens Square. Rode my bike over all the front yards and only got bitten by one dog! Now I live in Canada……a good move when I was eighteen! Mickey, did you work with Michael Sturgess during your time at Shell Mex and BP? He was from Watford and died in January 1973 in a lorry crash whilst at work. Where in Canada do you live? I am just moving back to UK from Winnipeg after a 16 year sojourn. Fed up with cold winters and mosquitoes in summer so time for some normality again, down in Cornwall! The open air pool, AKA Churchill bath, was a great facility with its huge lawn to sunbathe on. I learned to swim in that pool and then was a lifeguard there for near ten years. Sadly it is now a lot smaller than we remember. 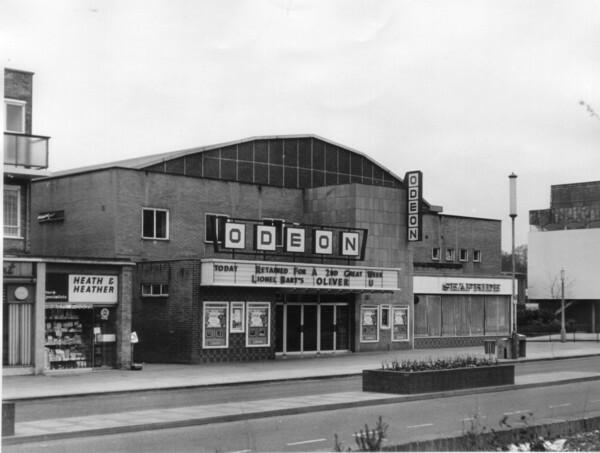 I also used to go to the Saturday morning cinema when younger but alas the Odeon is now gone too sadly. Hi My parents worked at Burtons school of dancing at the bingo. Our best friends were Chris and Keith Burton. Such fun. My Dad was always known as Taffy, he checked the bingo and sometimes called. My mum did the door (Mary). I also had lessons on a Saturday for years. My first Saturday job was at Seafare. Happy days ha ha. Well Christine, ,my first job was delivering milk with a milkman called Ted in Gadebridge. Then I went to work for DC Barker delivering papers in Gadebridge before becoming a marker-up. When I hit 17 I was marking up at Gadebridge news agents and then working Sunday morning in Barker’s Chaulden shop selling newspapers and tobacco. I quit this work when I went to work at Woollies and then Kodak. At Kodak I drove fork lift trucks and then quit to travel Euriope. When I came back from Europe I worked as a lifeguard at what was known as Dacorum Sports Centre, which I did for ten years with a one summer break when I went to work for the Holiday Fellowship in the New Forest. All a long time ago now but great memories! Just wondering if the Tracy HALE who commented went onto study at Cassio College? I lived in Hemel from 1963-1975 from the age of 3 until I just turned 16 and I can well remember everything you described. My dad worked for what was then “Shellmex & BP” in the building that straddled over Marlowes near the Magic Roundabout. We lived in Leverstock Green and I went to JFK in Warners End so I often used to change buses in town, between The Parade and the bus station. I think you covered everything in the town centre except I’m not sure if you mentioned “Bank Court” just off Marlowes on the bus station side, I think it was a pedestrianised area; my mum worked there in Lloyds Bank for quite a while. Looking back, I guess Hemel (referring to the new town which by then was most of it) was a bit of a melting pot of people thrown suddenly together, with housing estates springing up suddenly out of the green meadows and woods that had been there for centuries, ready to absorb the overspill from London. It was an ambitious and well intended project but you can’t uproot people and throw them together without expecting some issues, and I certainly don’t miss the skinheads that used to frequent certain parts of town. I used to like the parts of town that kept some of the soul of the past; the old parts of Leverstock Green, Two Waters, etc, and my best fun was helping on a farm on the edge of town, and fishing in the canal. A couple of generations down the line, although much of the early landmarks have gone (even my old primary school St Alberts near Bennetts End was pulled down and rebuilt a couple of years ago) last time I was there, after many years’ absence, Hemel somehow seemed more at peace with itself, more comfortable in its own skin. The council house we moved into in Poynders Hill straight after it was built (outside our door was still a building site) was bought by my dad and has now been extended and embellished like all the others, and carries a mouth watering price tag. The new patches of green with their freshly planted saplings that eventually appeared when the estate was finished now resemble pleasant mature parks shaded by the spreading branches of what are now mature, stately trees. I went into the local newsagent “Balfour” (it’s still called that!) for old time’s sake and bought a paper before telling the proprietor that 35 years ago I was in that very shop early each morning, preparing to go out on my paper round. He told me he was short staffed and that if I could still find my way around The Horseshoe and Malmes Croft, I could have my old job back!!! Thanks for your interesting comment Justin. I love that you feel Hemel is now more at peace with itself, nicely put. I really must go back for a visit and wander round some old haunts! Hi Lisa, my dad passed away in 1996; I remember the names of some of his colleagues but he worked in that office block that formed a bridge over Marlowes so Im not sure if he’d have met your grandad. I do seem to remember something about a tanker crash though, How awful that must have been for the family.,I do wish you well in tracing some of his colleagues. Many years ago I used to know a girl who was, I think, a pupil at John F Kennedy in Hemel. I lost touch but I would like to contact her. I was born in Hemel, in my council house on Cattsdell back in 1963. It’s strange that I have always looked at Hemel as being home. We moved to Australia in 1976, I had formed all my friends by the time I was pulled away from all the family and friends. I have returned on holiday a few times as I have family all over Hemel, my grandad managed a farm at Leverstock Green and my uncle still lives in Leverstock Green. I have tried to catch up with a few people over the years but I have not been able to locate people. I attended Bellgate right through my young years until I attended highfield in 1975. I lived next door to Gert Evans, great mates with Keith Sells who had sisters, Tracy and , sorry can’t put a name to her. I knocked around with a lad called Mark Woods? He lived in the area behind Bellgate shops. My hope is to visit again either the end of the year or next year and would like to catch up with a few of the people of old. Charlie do you remember her name? I was at JFK 1970-1975, if she was there during that time I might remember her. Having said that, I found an old schoolfriend on linkedin recently and while we were reminiscing he asked if I rememberered Cath Connolly. I then went on to tell him how I’d taken her to a New Years Eve disco at Leverstock Green youth club but ran out of money so had to walk her home to Adeyfield in the freezing cold. And that, of course, was that!! He then replied that he had been living with her for many years and they had shared a house near Cox’s Pond, and that she had recently passed away. Perhaps I should have listened to his full story before telling him mine. Came upon this whilst trying to find out where the old telephone exchange was in Hemel. I had a job there as a telephonist but I cant sort out in my head WHEN… its a toss up between 1968 and 1973 just cant unravel it. Back then, if you could get GPO trained you were top of the picks when applying for other telephonist/reception jobs. Enjoyed reading your memories. I grew up in Berko in the 60’s but as a teenager during that period I spent a lot of time there on a Saturday. I used to walk from Berko to Boxmoor … feed the ponies…go into town and the Whimpey bar, I went to Dacorum College (fell in love there) what wonderful times. Moved to Mousehole, Cornwall for a few years and returned home to a council house in Warners End in 1978….Hemel was still Hemel then…I got a job athe the Fishery Inn….lovely place then and now . Moved back to Cornwall by the end of the 70’s but still have family and friends up in Berko and Hemel so visit around 3/4 times a year. Keep up the memories….I had forgotten the name of that toy shop!! Taylor McKenna was the toy shop at the bottom of the spiral ramp below the Wimpey Bar. Taylor McKenna also had an upstairs floor with door leading out opposite the Wimpy bar. Up there they had model kits and all those little enamel paint pots to paint them! So many memories on this page!! I remember the market with its clothes stalls etc and used to get my haircut in the barbers in the market square and the 2 barbers used to leave their fags burning in the ashtray while they cut your hair. Went to JFK 75 TO 80 then to Cassio College. Worked at Kodak House for a while and the Moat House Hotel in Bourne End, used to drink in the Railway and the Red Lion in the Old High Street, some people I remember and would love to meet again, Tracey Ellis Debbie Blow, Andy Knowles,Mark Lambert,Caron Nicholas,Jaquie Nicholas,Greg O’Brien,Vincent Ryan,Georgina Jackson I havn’t been back to Hemel for about 25 years must revisit some old haunts if they are still standing!! Born in St Pauls Hospital in 1952 but moved back to North London with my parents when I was two weeks old. Moved back to Hemel in 1960 and lived in Larchwood Road. Was the first pupil registered at the new Highfield Junior School (I think it might be called Yewtree School today). We were tranported by bus to Pixes Hill off Chaulden Lane for the first year while we waited for the new school to be finished. Rossgate were also at Pixes Hill at that time for the same reason. I subsequently joined the first year of Highfield Secondary School in 1963, which was also brand new at the time. Upon leaving in 1968 I went to work for John Dickinson’s for five years, then left and joined Shell/BP until 1978, when I fell head over heels for a Swiss girl and went to live in Switzerland. We got married, had two children and because of my job have since lived in Sweden, Japan, America, Singapore, Bahrain and now Dubai. Hemel was a lovely place to grow up in and I have so many nice memories of those early days. Trainspotting at Boxmoor Station (steam locomotives then). 10 minutes walk from Larchwood Road and you were in the heart of the countryside (Grove Hill had not been built). Freewheeling down the Queensway with my mates on our bikes at full speed (no helmets). Hair-raising to think about it today. Playing football in the street (jumpers for goal posts) and getting annoyed when we had to stop the game because a car had the cheek to want to pass by. Standing on the bridge by St Pauls Church, Highfield on my way home from school trying to drop stones down the chimney of the steam engine passing underneath on the old Midland line. Attending the first childrens Saurday morning matinee at the Odeon. Anyone remember the Presto Bar next door? Hemel Town F.C. played at Crabtree Lane back then, Hemel United at Vauxhall Road and Hemel Rovers at Randalls Park, later moving to Reith Fields behind the Venture in Queens Sq., Adeyfield. Moorend / Magic / Funny roundabout was referred to as the Plough roundabout and I seem to remember there were still railway sidings along Cotterells where local coal merchants had their bunkers, although they disappeared when they demolished the viaduct down where the Wagon used to be, which then became the site of the Shell Mex Building. For a short while there were three cinemas in Marlows. The new Odeon, the Princess which I seem to remember was where the Pavilion used to be, and the Luxor, which was somewhere roughly where Woolworths was. The latter two did not last long. If any of my old school or work colleagues, or anyone who knew me would like to get in touch I would be delighted to hear from them. I live in Hemel Hempstead now Chaulden with my three kids. I would like to know if anyone has heard of Linda Cunningham. She lived in Hobbs Hill Road and worked in the Co Op, years looking for are between 1982-84. Also lived in Grove Hill and still does… anyone who worked on the market back in those days with any info please comment. Hi Peter. Went to Highfield school in 1960-68. Was in Mrs Meads class and also Mr Griffiths. Believe you had a nickmame of Flemingo or shotened to Dingo.Got a lot of memories. Hope to hear back from you. reading this was like reading my own memories… I was born in St Pauls hospital. I lived in Fletcher way, and I was one of the first pupils at the new school in highfield I was a 1st junior ..I had gone to George Street primary. I went to the senior school in 1968. we used to run to the same bridge and watch the steam trains go under but we used to wave to the driver and then the guard not drop stones lol..loved that smoke billowing out. Hi.I lived in Hemel from 1962 til 2010. Reading these letters have brought so many memories flooding back. I have been trying to find photos of my old schools Martindale Primary in Boxted Road and Halsey School. Am struggling, any help would be gratefully appreciated. Repair shop in Alexandra road in the 70s /80s? Wonderful to read all these comments about Hemel Hempstead which is my Home Town. I was born at Felden, near Bovingdon and worked at John Dickinson at Apsley Mills in the Machine Accounting Department, between 1965 and 1968 with Colin Roberts, Brian, Mr Turl who was the manager and Mr Searle the boss. My Mother worked as a supervisor in the Order pulling section . She had 18 staff and worked there for as many years. I have her long service certificate. I think it was some 20 years service there she did overall. I also worked at Addressograph Multigraph of Maylands Avenue from 1968 to 1974. Machine Order Control department (order progressing). I worked with Geoffrey Turner of Adeyfield, Steve Queen and a Mr Sells was in charge. Douglas Hearn was the Marketing manager who went to live in Torquay area I believe. There was a chap called Frank who was the Foreman of the Despatch department. A Mr Twaddle was always being asked to go to the nearest external telephone. Very successful firm with 400 people in the factory and large numbers in the office. I am particularly interested in hearing if anybody remembers any of the people I have mentioned here. Particularly Mr Turner who was my boss at the time. I also worked part time for Securicor at the weekends, mainly at Kodak 2, the Training Centre that was in Gadebridge park and which I think is now called Sovereign Heights. There were other people but cannot remember their names now. I am also on Hertfordshire Memories website as well , with a photo. Wonderful set of pictures of Marlowes. I particularly remember Taylor McKenna where I bought Minic Motorway pieces each week. Also the Cinema. Hopkinsons the Dentist opposite the cinema and the library and so much else. Not forgetting the old high street. I went to Bennetts End Secondary Modern. Renamed Mountbatten school. Thiegh (not sure about the spelling) was the name of an opticians in Waterhouse street. Went to them as did the family. I also was a member of Maylands Players of Adeyfield for three years. They operated out of a primary school there. Emlyn Williams plays and various pantos. Lots of memories. If anybody wants to come back on the names of people I mentioned, or anything else, then please do so.